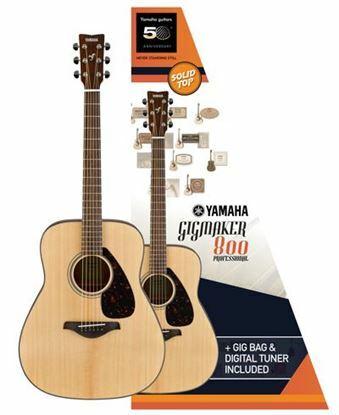 Acoustic guitar package including FG800NT guitar with solid Spruce top and Korg digital tuner. Gloss finish. Acoustic guitar package including FG800MNT guitar with solid Spruce top and Korg digital tuner. Matte finish. FG acoustic guitar with solid Spruce top, Mahogany back and sides. Autumn Burst finish. FG acoustic guitar with solid Spruce top, Mahogany back and sides. Black finish. FG acoustic guitar with solid Spruce top, Mahogany back and sides. Brown Sunburst finish. FG acoustic guitar with solid Spruce top, Mahogany back and sides. Natural finish.